I have been in a number of elevator pits harboring around two feet of water due to water leaks. These pits are usually at or below the water table, underneath the first floor of buildings with concrete poured around them. Over time the water tables rise and fall due to seasonal changes. This causes the soil to move, creating problems in the structure. These leaks are common in commercial buildings, especially if the elevators are not properly maintained. There are several reasons why these elevator pits spring leaks and cause problems. One of the main causes of these leaks is faulty waterproofing that was incorrectly installed during the construction phase. This allows joints that go around the elevator pit to leak due to imperfections or cracks in the base or walls. Another cause is simply time itself. As the elevator pit ages, the waterproofing system in place naturally begins to fail. The outside membranes begin to break down and negatively affect the performance of the waterproofing system. The solution depends on the type of structure. You're usually looking at either poured concrete walls, block walls or brick walls. In the case of concrete walls, water will seep through by way of cracks. You can counteract this problem by crack injecting with Alchemy-Spetec’s Spetec F400 or AP Seal 500. They both work well in wet conditions and are water reactive. In the case of both block and brick walls, movement in the soil due to water table changes can move the individual blocks or bricks - causing gaps to occur. These gaps result in issues like leaking floor/wall joints and border joint leakage/decay. You can counteract these problems by injecting grout through the wall into the outside soil (a process called curtain wall grouting) with Alchemy-Spetec’s AP Fill 700 or Spetec H100. All of these products can also be used as part of preventative measures during the construction phase. 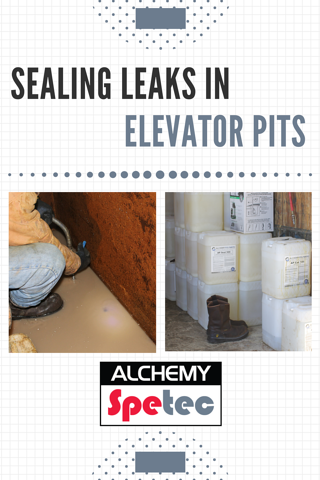 Want more information on sealing leaks with Alchemy-Spetec products?